So, I’m gonna let you in on a little secret. I am constantly strategizing and thinking of ways to connect with my audience (you). Showing up on Instagram daily and posting a blog post twice a week isn’t enough for me. It could be my people pleasing personality, but I have a strong desire to meet my people where they’re at and make them feel important to ME. Which means, there’s a strategy behind every move I make in my business. I cringe a little when I say that because I so strongly focus on loving people. And that love and desire to encourage others is 100% genuine. But, while I function to love and support others, I also have a very strategic brain. So, beyond loving a supporting my audience for the sake of helping others, I am also building a tribe. This tribe is built on showing up for my people and sharing how important they are to me. Therefore, there are multiple places I connect with them daily. Connecting with your audience doesn’t happen in one place. Experts say consumers have to see an ad SEVEN times before remembering it. We are inundated with content all day long. That being said, we must find ways to connect with our audience repeatedly. You can’t post one picture of your product and expect your audience to remember it. You have to remind them. You have to talk about the pain point you solve ALL THE TIME. You have to build your tribe constantly. It feels like you’re bugging them. But! People forget or people don’t see it! Especially with all the algorithms on social media, loads of your followers are bound to miss your posts. When you feel like you're annoying, that’s when you know you’re talking about it enough! Creating a touch point with your audience isn’t just on social media. It’s in how you respond to emails and direct messages. It’s in your packaging and your branded shipping materials. 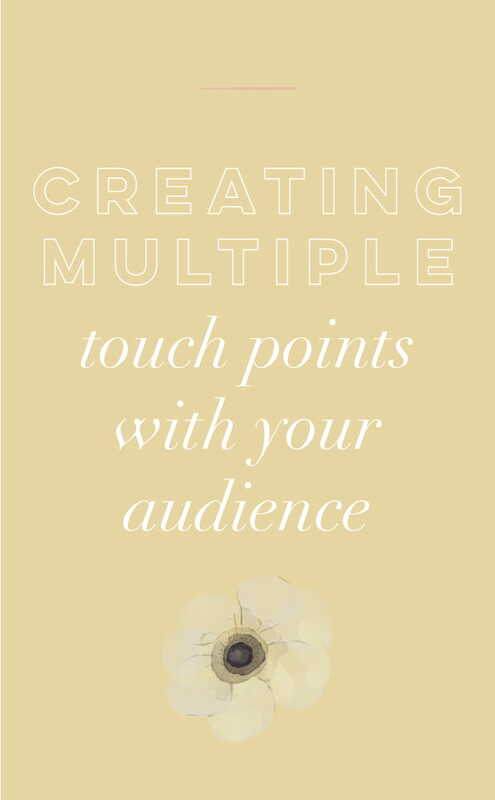 When you have multiple touch points with your audience, you’re able to be in their view more often and become a common appearance in their daily life. Nurturing your audience through connecting them in multiple places will help you build a strong customer base, raving fans and increase your sales. Can you think of other ways you can engage with and connect with your audience? For each of the places I connect with my audience, I create a small mission statement for the purpose. So for example, my mission for my packaging is to ensure that my customer feels like they are receiving a gift every time a package arrives. Pick 3-4 places that you can connect with your audience and master them. After that, write a short mission statement for that platform. A mission statement simply includes why you use you something and what your desired outcome is. Ultimately, you should have purpose behind every move you make in your business and as your grow your business, you want to be focusing on how to serve people. Think about all the ways and places you get to connect with and talk to your audience. Now, start being strategic about it!